The humble bibingka, a Filipino rice cake, is one of the “most traditional” holiday treats in the world. 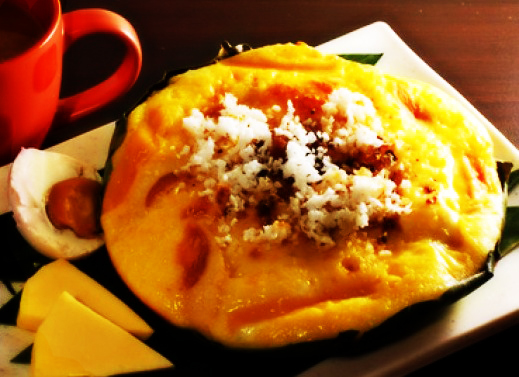 The sweet and salty bibingka has a soft and fluffy texture similar to puto, another Filipino rice cake, and is eaten warm. Although a popular street food, it is usually in demand with locals and even tourists during the Christmas season when it is one of the delicacies sold by vendors outside the churches after the traditional night mass or Simbang Gabi. The well-loved Filipino rice cake Bibingka, is made from galapong, (glutinous ground rice), eggs, sugar and coconut milk, the bibingka is placed on a banana leaf-lined pan and baked in a clay oven with coals underneath and on top of a metal cover. The bibingka is topped with kesong puti (native white cheese), itlog na maalat (salted duck's eggs), butter, and sugar depending on the recipe of the cook and it’s served with grated coconut. 1. Preheat oven to 350ºF. Grease and line bottom of 2 8-inch layer baking pan with banana leaves or wax paper. Set aside. 2. Sift flour, baking powder and salt together. Set aside. 3. Beat the eggs until light and creamy. Gradually add sugar, beating well after each addition. 4. Add flour mixture alternately with NESTLE Fresh Milk into the egg. Beat to blend thoroughly. 5. Pour mixture in lined pans. 6. Bake for 10 minutes, then remove from the oven. 7. Spread butter on top then sprinkle with sugar and grated cheese. 8. Decorate with salted egg slices and bake for 10 to 15 minutes more.